On our trip to Toronto, my friend Dennis who now lives there desperately wanted to take us for some KFC. No, not Kentucky Fried Chicken but Korean Fried Chicken! I was not familiar with Korean Fried Chicken but quickly learned about the differences in style compared to the American version. 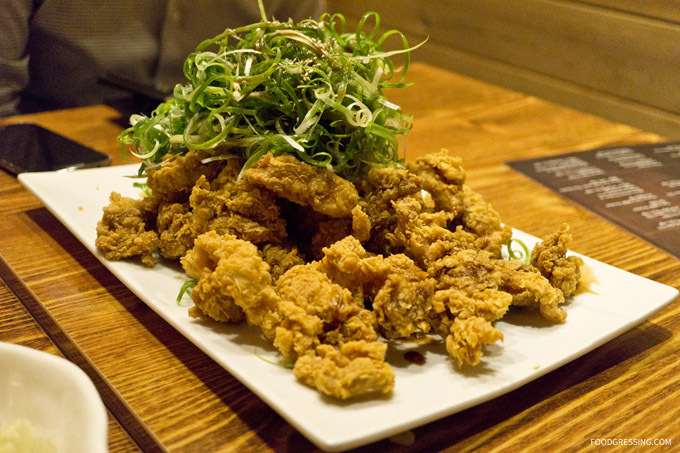 First of all, Korean fried chicken is fried twice, resulting in a crunchier and less greasy skin. The chickens are typically seasoned with spices, sugar, and salt, prior to and after being fried. Younger chickens – that is, small- or medium-sized chickens – are used resulting in more tender meat. The chicken is also usually hand painted with a brush, to evenly coat the chicken with a thin layer of sauce. Our friend suggested The Fry for dinner and we made our way there one evening. 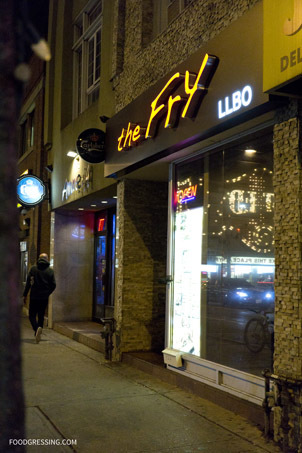 Located at 524 Bloor Street West, The Fry is the chain’s Downtown Toronto Location (2 others are in North York). 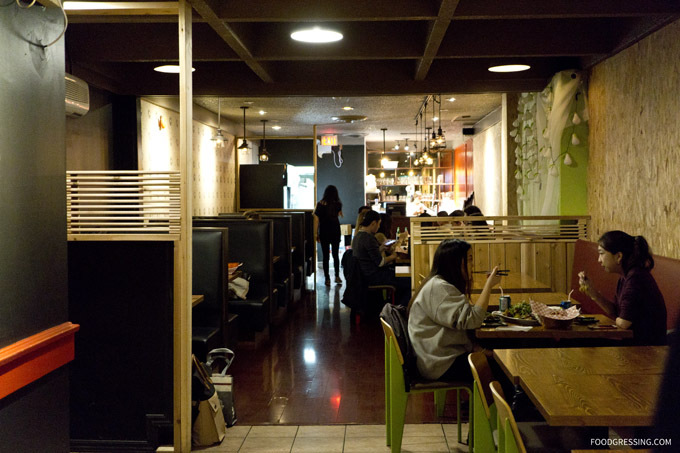 It is a small restaurant with several booths and dining tables. There was nothing too remarkable with the decor but the dim lighting set a dingy, pub-like ambiance. After all, beer and KFC are an ideal pairing. The Fry has a salivating selection of fried chicken varieties including green onion chicken, soy chicken, spicy BBQ to name a few. There are also a few drumstick and chicken tender options without bones. 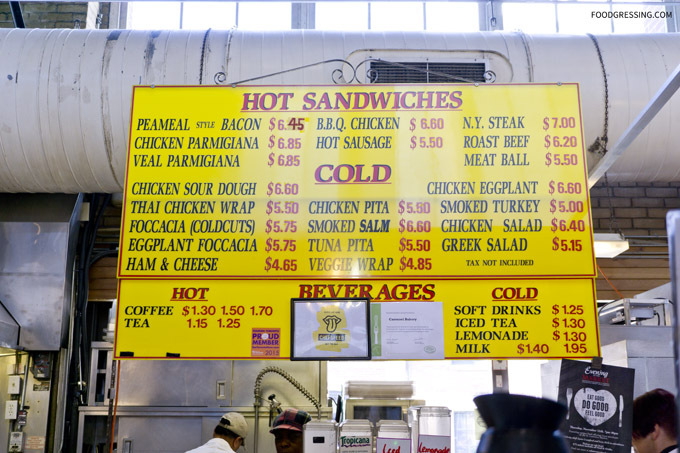 The small fried chicken dishes start at $16 while the large sizes and specialty ones are upwards of $29. 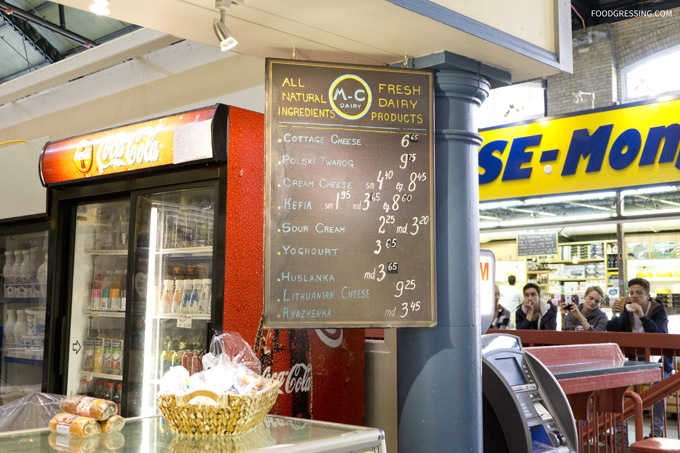 Yes, at The Fry, you can easily spend $30 on fried chicken. Other dishes to complement the fried chicken include egg rolls, corn cheese, spicy rice cake as well as soups and stews. To start, we had a complimentary corn cheese appetizer. 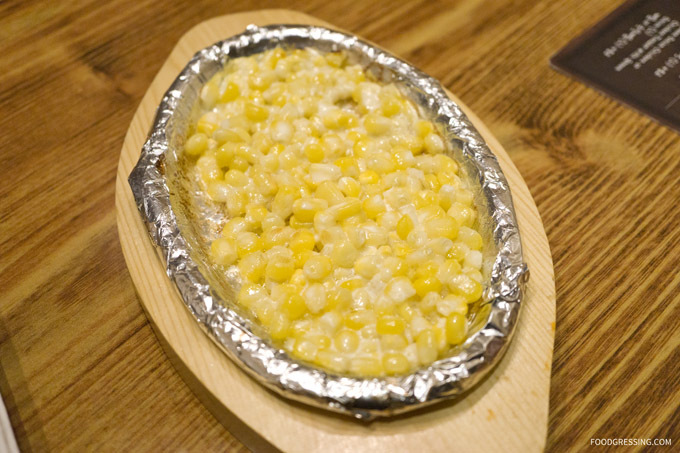 Quite the comfort food with the melted mozzarella and the sweet and buttery corn. Next up was the large green onion chicken ($18.99). 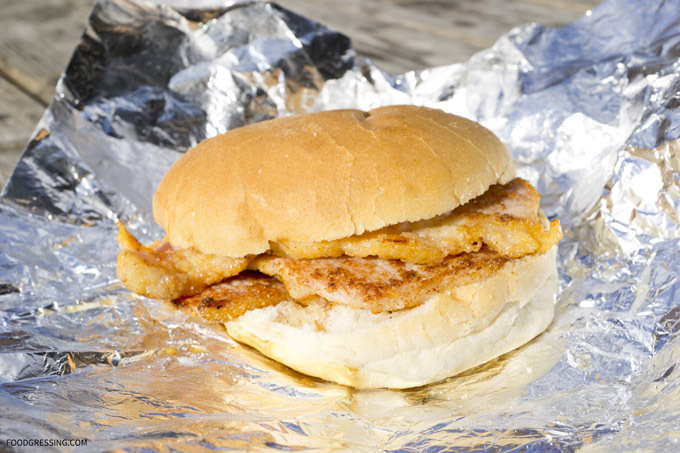 It was wonderfully crispy and the batter was crunchy but light. The chicken pieces were not distinctly cut as identifiable parts of the chicken. However, they were juicy, tender and flavourful. The pile of green onion on top of the fried chicken added fun to the presentation. It went well with the fried chicken and offered a refreshing taste. Very good overall. 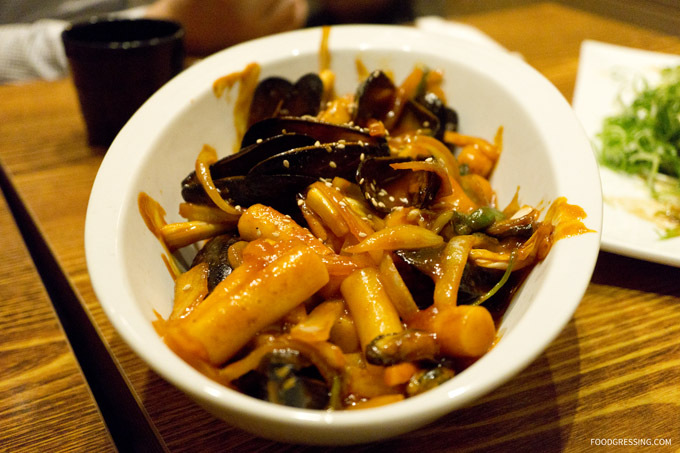 Finally, we had a spicy rice cake with seafood. I really loved the soft, glutinous texture and sweet taste of the rice cake. The sauce was nicely spicy and sweet; it offered a good change of taste from the fried chicken. What lacked the most at The Fry was the service. We had to call on our server to refill our water glasses and bring us more napkins. 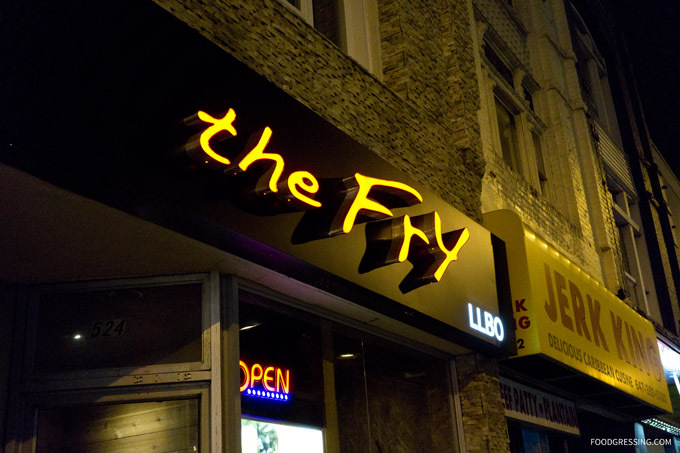 For more information on The Fry, visit them at their website. One night during our trip in Toronto, we decided to grab some late night takeout on our way back to to the hotel. We were in Toronto’s Chinatown and came across House of Gourmet which was still busy with customers at that time. We decided to give the restaurant a try in hopes of come cheap and cheerful eats. A review of the House of Gourmet takeout menu was a bit daunting. 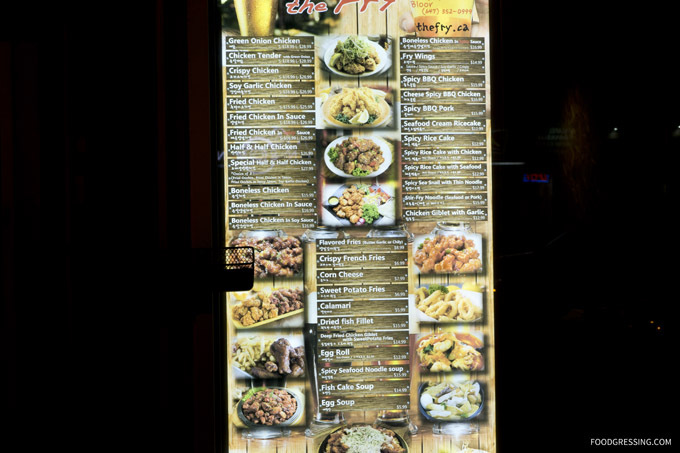 The takeout menu boasts a whopping 426 items available. You can see the menu for yourself on their website. On offer are varieties of rice and noodle dishes including congee, noodle soups, stewed noodle, fried rice, fried noodles, curry on rice, and baked rice. After a few minutes looking at the menu, I put in an order of #226 – stewed noodle with shrimp wonton ($6.25) and #311 – small rice with barbeque pork ($4.75). When we got back to the hotel, the food was still fairly warm. The wontons and noodles came in one styrofoam box and the soup was separate. 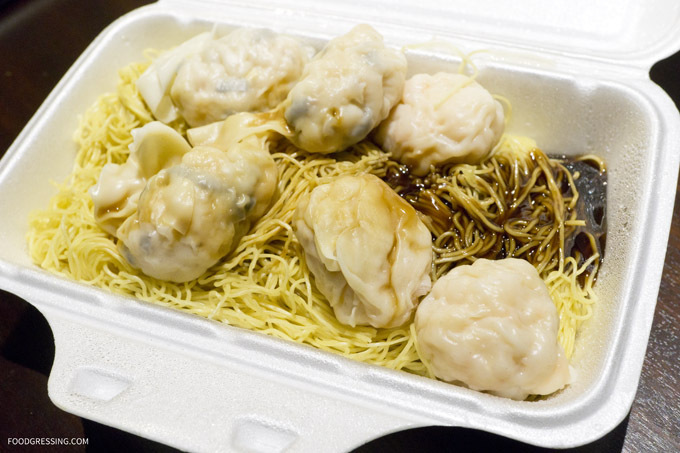 At first glance, the portions given were good for the price particularly the size of the shrimp wontons. 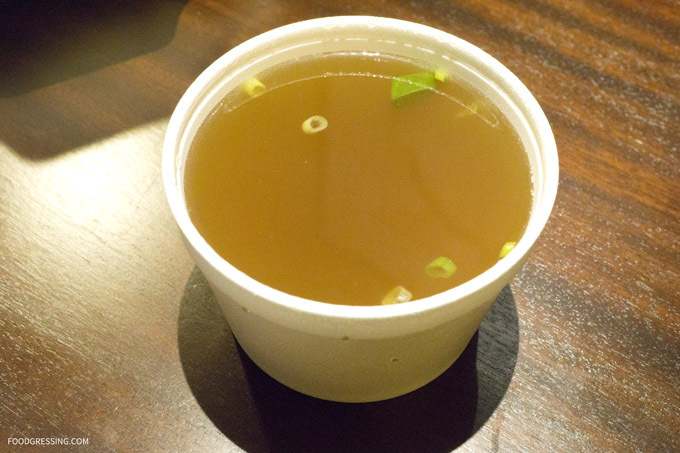 Unfortunately, the wonton soup was just too MSG-laden and overly salty. It was almost better to just have the wonton and noodles on their own. 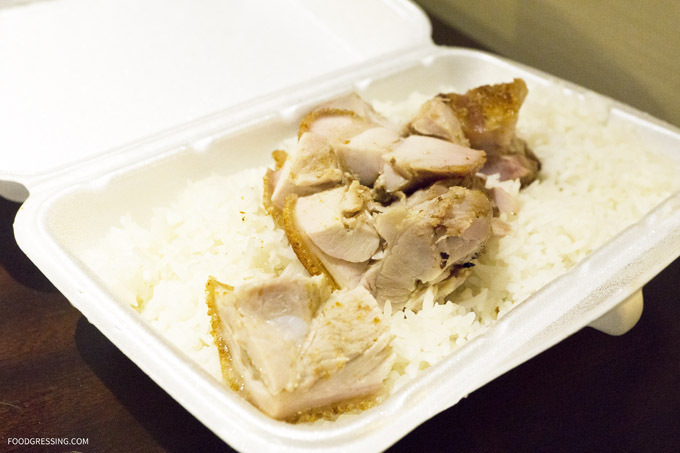 The barbeque pork did not have a very crispy skin, but at least they did not skimp out on the rice. 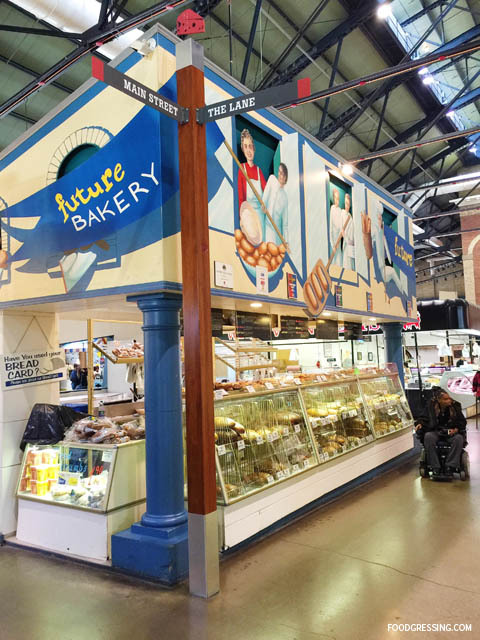 For more information on House of Gourmet, visit them on their website. A few months ago, in Toronto, I was prowling around Queen Street one night for some late night dessert with my husband, son and friend. Just a few doors down from Fresh Off The Boat, which I tried the day before, was Kekou Gelato. I didn’t know much about Kekou Gelato, nor did our friend who now lives in Toronto. Seeing as how there were quite a few customers inside at that time, we decided to give it a try. I was immediately surprised by the flavours offered by Kekou – that is, Asian-inspired! 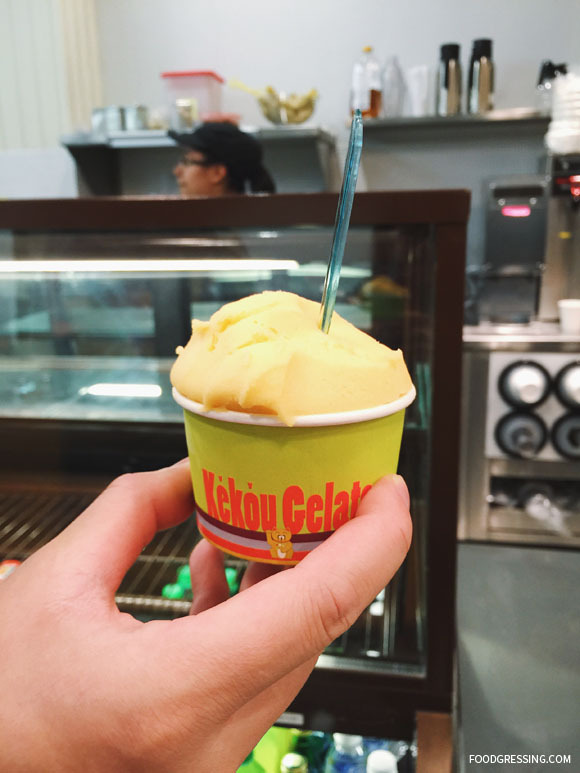 At Kekou Gelato, you can enjoy gelato in flavours like red bean white chocolate, Chinese 24 herb tea, durian, and roasted oolong tea. 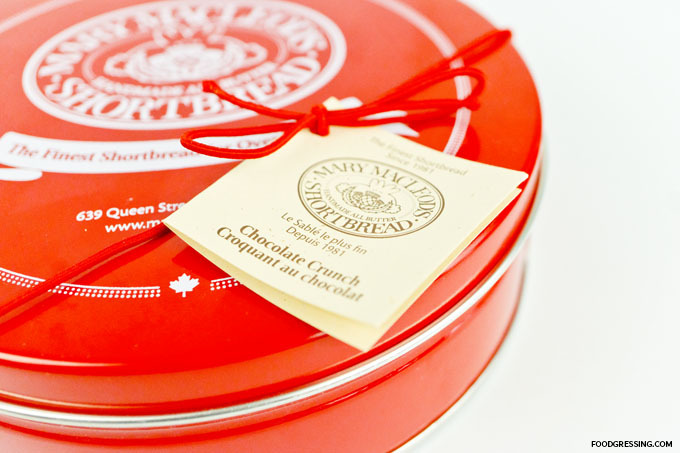 These flavours are in-fact made in-house. Those who are lactose sensitive may enjoy non-dairy sorbet flavours like Tsing Tao peach and Osmantus plum berry. They also offer soft serve in flavours like jasmine tea and almond tofu. 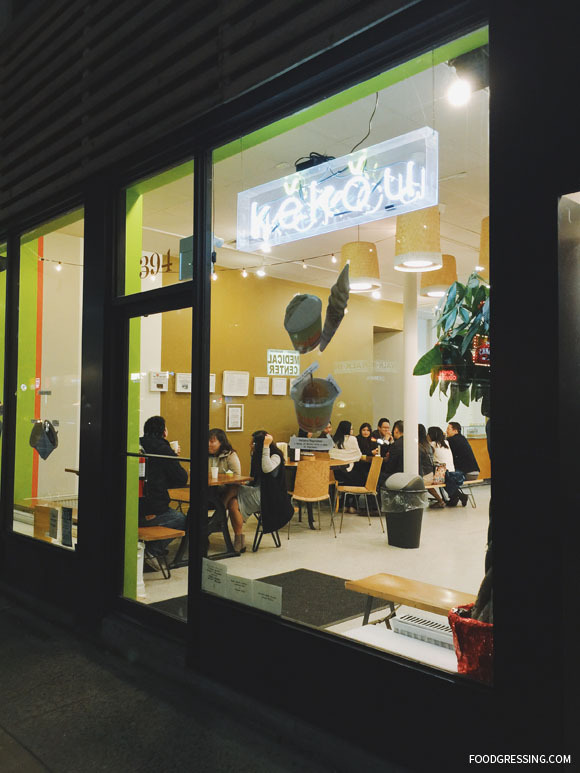 Kekou Gelato’s soft serve is from a base which is pasteurized and aged for 10-12 hours. 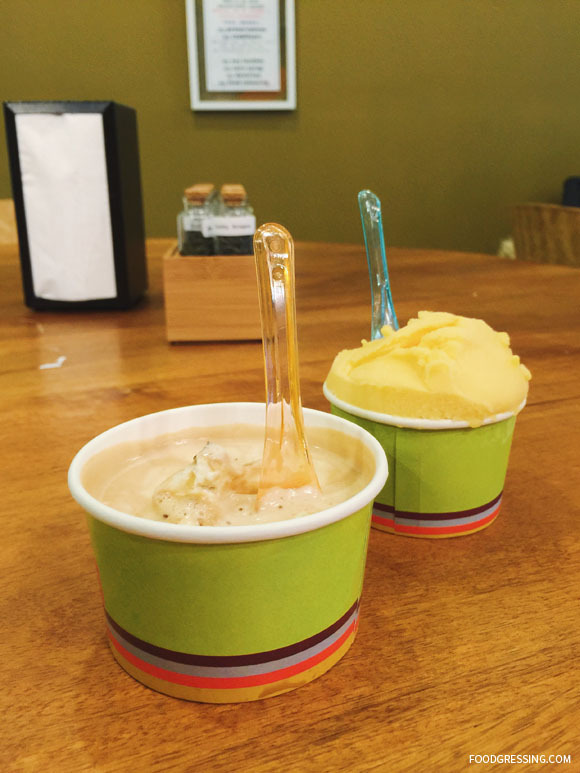 Gelato cups come in three sizes: small ($3.75), medium ($4.20) and large ($4.86). Sugar cones come in one ($3.57) or two scoops ($4.43). 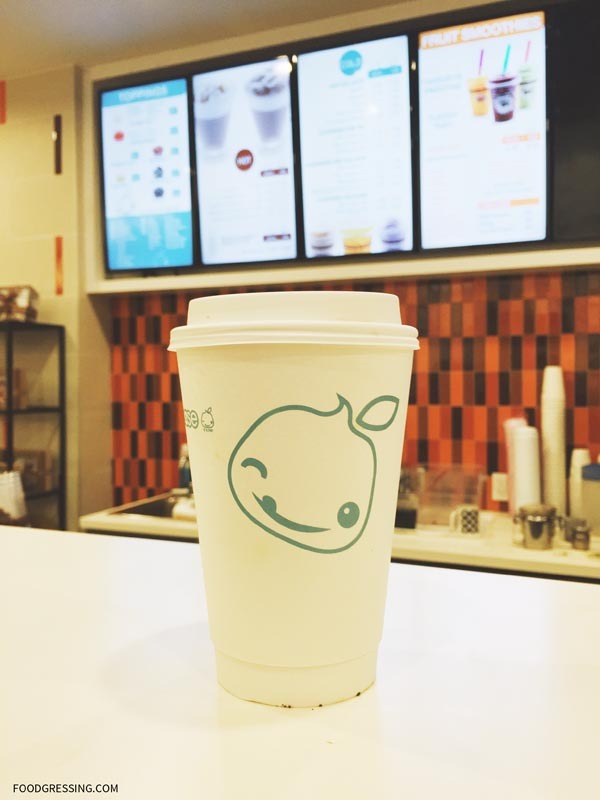 A variety of drinks including loose leaf teas, drop coffee, Vietnamese style coffee, and steamed milk drinks are also offered. 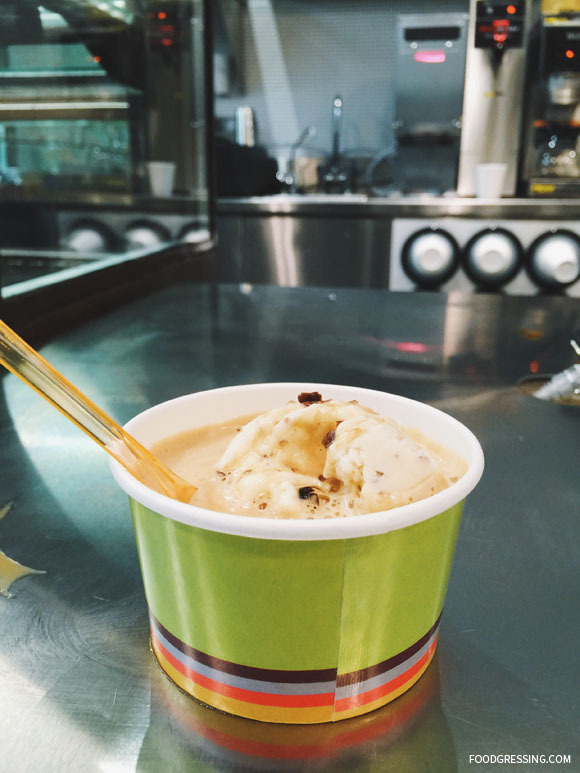 You can also get an affogato, which is a gelato-espresso mix. 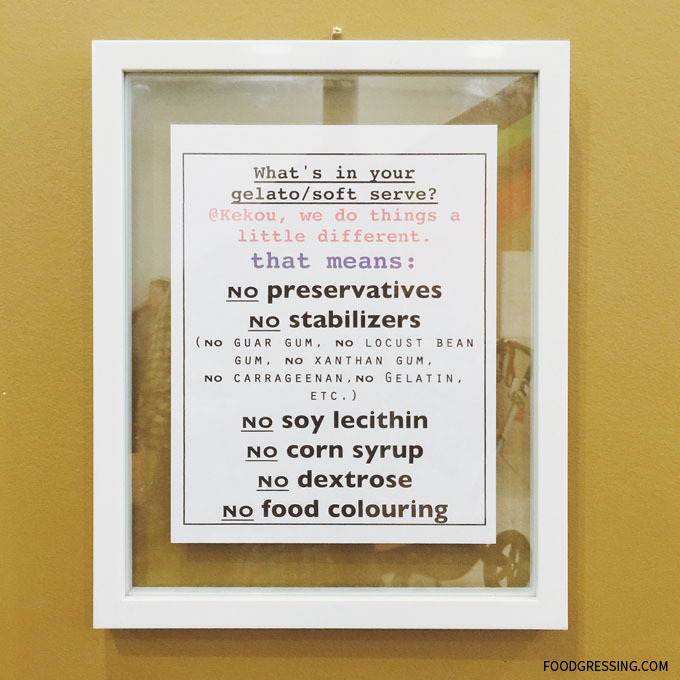 Kekou Gelato does not use any stabilizers in their gelato. Because of that, their gelato is less smooth than traditional gelato. Stabilizers are what cause traditional gelato to be smoother and to maintain that smoothness for a longer period of time. 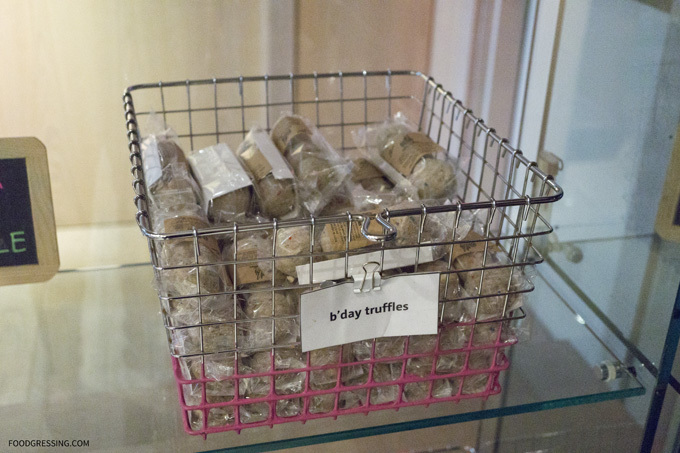 Because they do not use stabilizers, their gelato is crafted in small batches to ensure freshness. 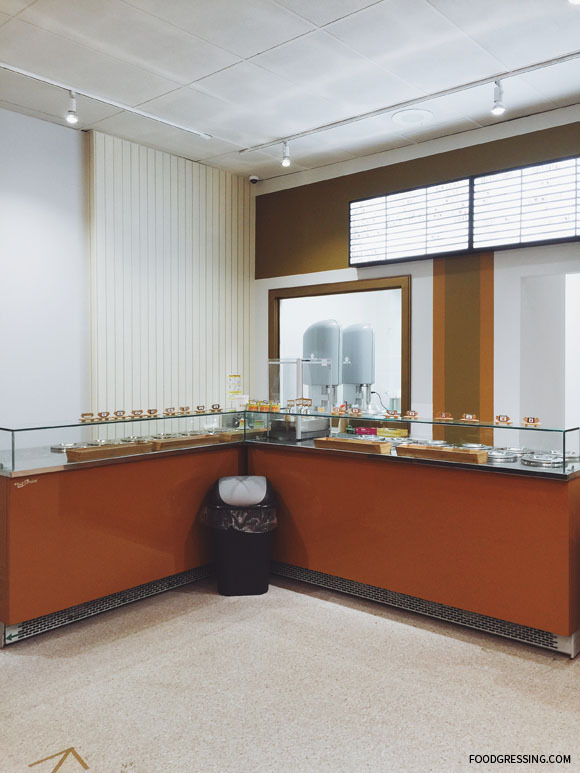 Furthermore, they use natural ingredients – real fruits and real tea leaves – in their gelato base. After trying a few samples, I went with a red bean white chocolate affogato. It had a really fun play on textures as the espresso melts the gelato continuously. Pretty tasty overall, and the red bean white chocolate flavour went well with the espresso. Our friend had a mango gelato which he thought had a nice smooth texture (despite not using stabilizers) and a delicious mango flavour. For more information on Kekou Gelato, visit them on their website or social media: Facebook and Twitter. 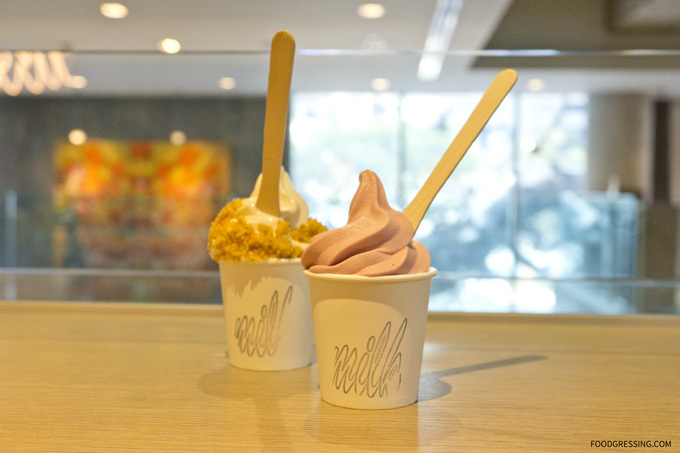 When I was in Toronto last month, I researched interesting places for desserts and came across several Instagram posts of the soft-serve from Momofuku Milk Bar. 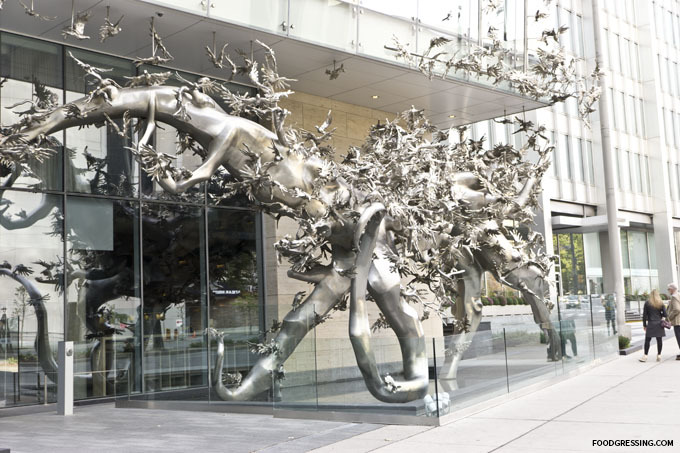 Fortunately, Momofuku was located right next to the hotel we were staying at, The Shangri-La. 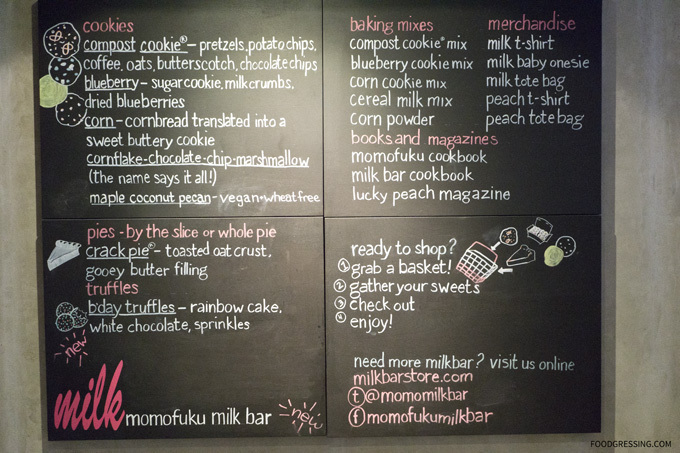 The Momofuku Milk Bar has several locations in New York City and Washington, DC but this Toronto location is their first outside the USA. I was looking forward to getting their soft-serve to go and enjoying it in the hotel room with the family. 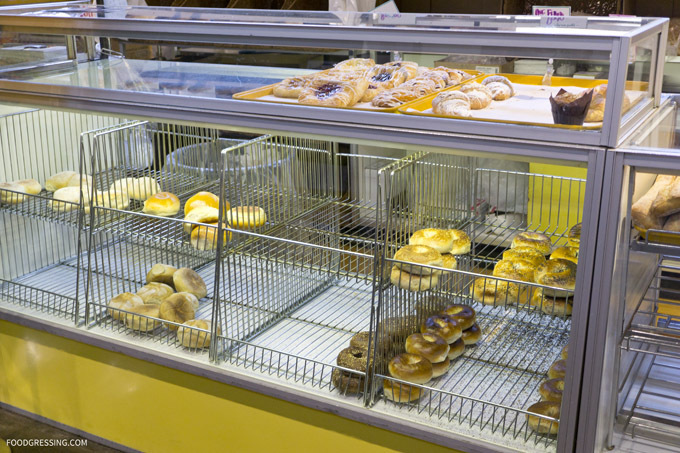 All these baked goods are made in New York and shipped same day to Toronto apparently. The items seemed generally more expensive likely to the branding and being imported from the New York daily. I browsed around the room but only wanted to try their soft-serve. You order at the Noodle Bar and the staff person goes to the kitchen in the back, prepares the soft-serve and then brings it to you. I found it a bit awkward to be honest…..ordering at the Noodle Bar because it felt separate from the Milk Bar. 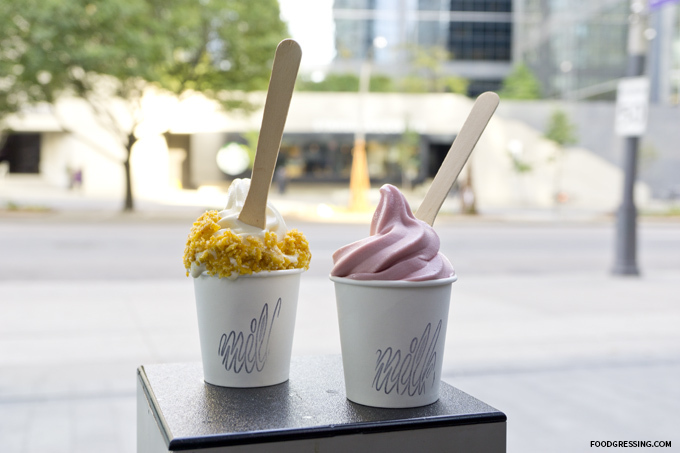 I ordered two soft-serves costing around $14 with tax: the cereal milk soft serve and a cranberry limeade. The soft-serves had a nice creamy texture, were subtlety sweet and refreshing, though nothing to write home about. The cereal milk soft serve was definitely reminiscent of the milk at the bottom of a bowl of cornflakes as intended. The cereal flakes were quite crunchy while the cranberry limeade was tart and tangy. Their soft-serve was good though not the best I’ve had. 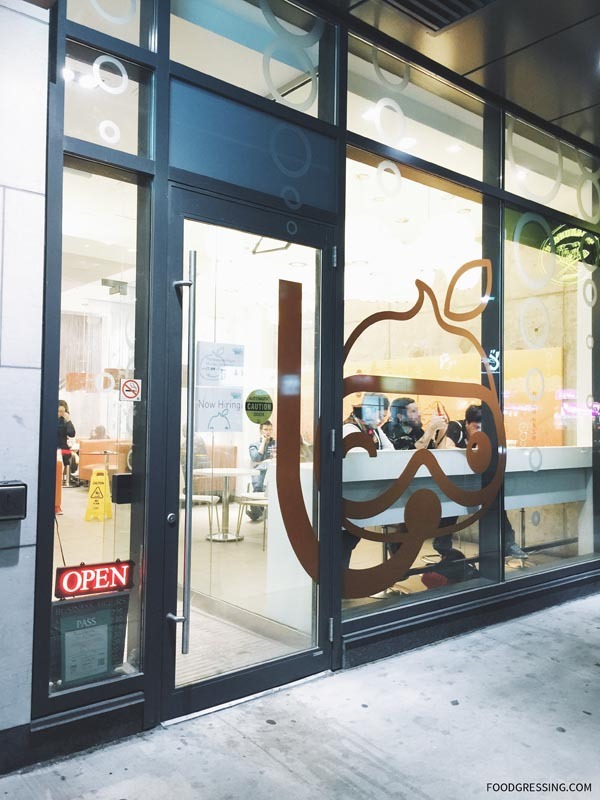 In terms of creativity, Soft Peaks in Vancouver and Sweet Jesus in Toronto have one-ups on Momofuku. After our lunch at Blaze Pizza, we wanted to grab some coffee and came across Panera Bread on Yonge. 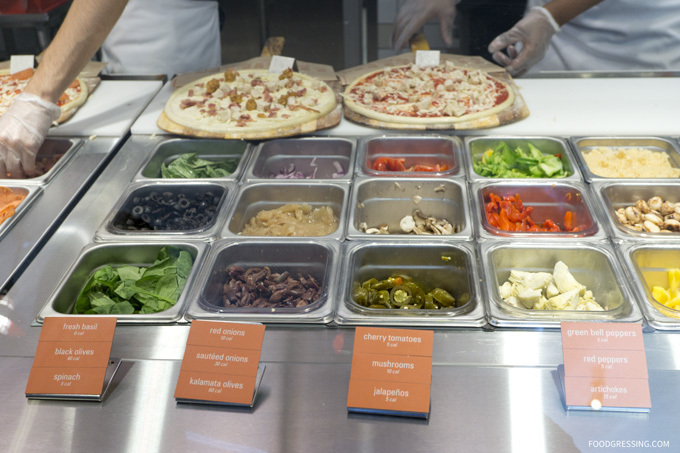 Like Blaze Pizza, Panera Bread is a US chain and they feature bakery products, sandwiches, and salads. 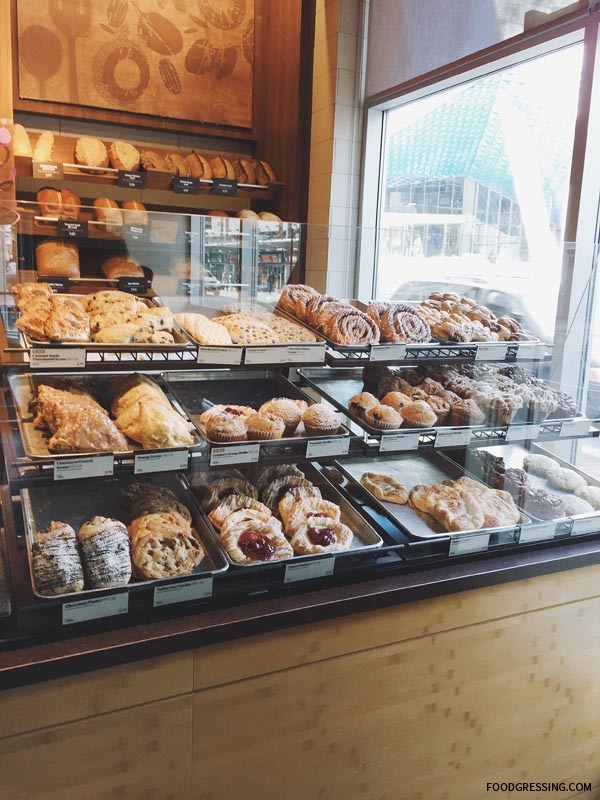 Panera Bread along with sister bakery-cafes, Saint Louis Bread Co. and Paradise Bakery & Café, have over 1,900 locations in the US and in Ontario (now, that’s a lot!). I had never been to any Panera Bread location before and was interested to see how they are compared to the beloved, Tim Hortons, in Canada. 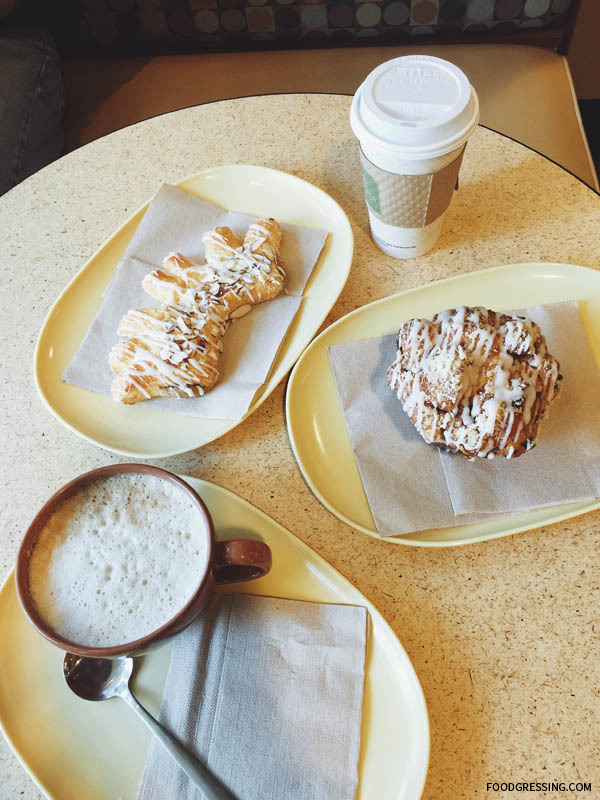 Panera Bread offers your typical café fare like soups, sandwiches, pastries, paninis, and salads. 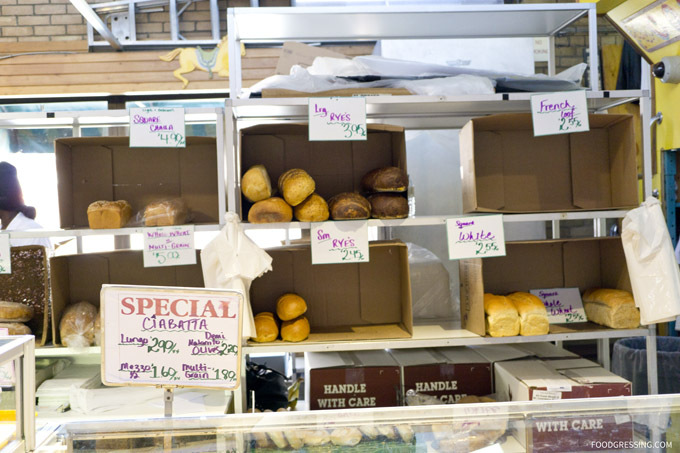 Aside from that, they freshly bake bread ever day and sell them by the loaf. 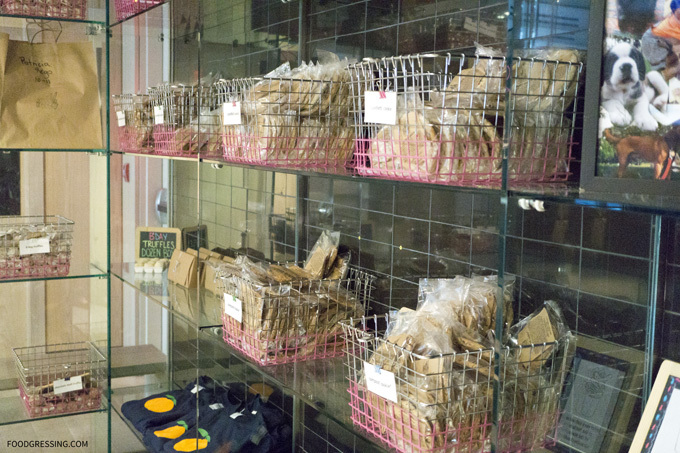 You can select from an array of artisan bread including sourdough, honey wheat, ciabatta, and rye. 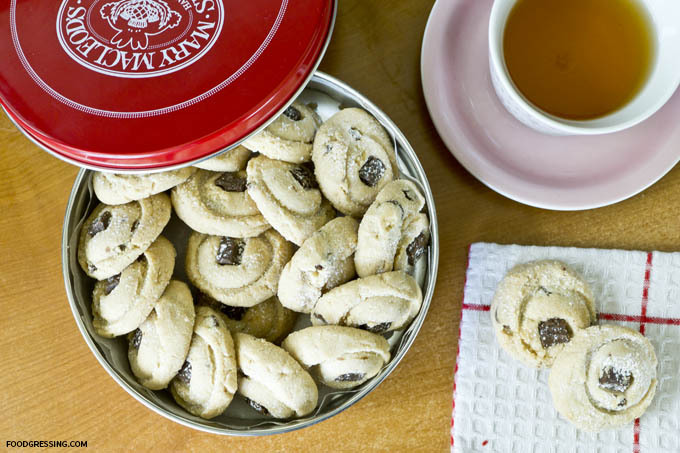 For the health conscious, the number of calories is listed on the labels. 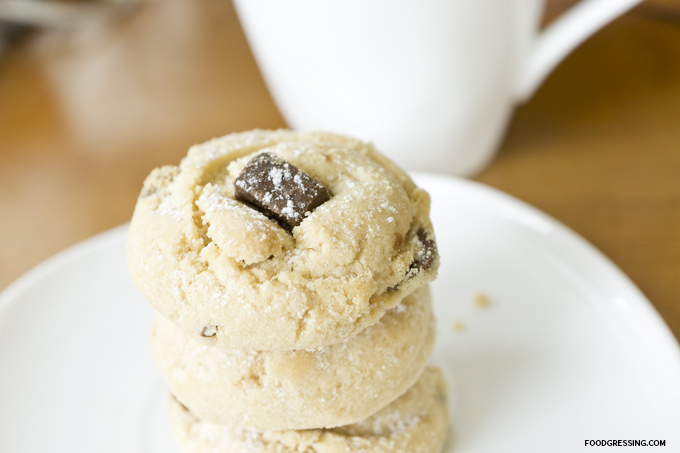 Otherwise, skip the math particularly for the baked goods. 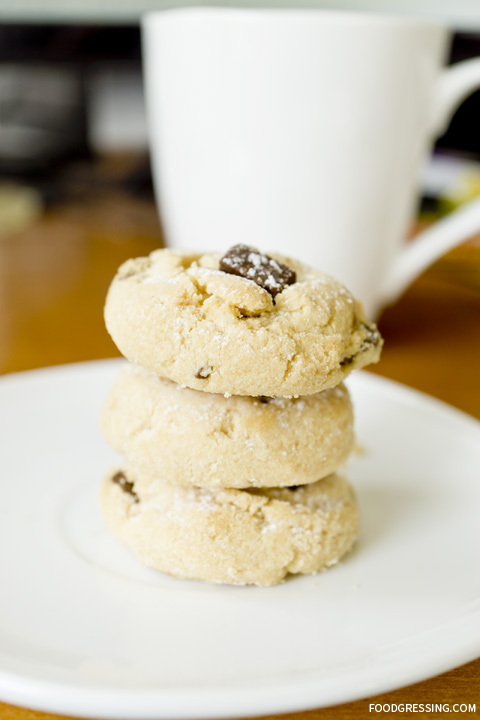 Just looking at them and you’ll know that they are nutritional catastrophes! One major difference between Panera Bread and Tim Hortons is that Panera Bread offers a sit-down style restaurant if you dine in. You receive a pager and employees bring you the food when it is ready. 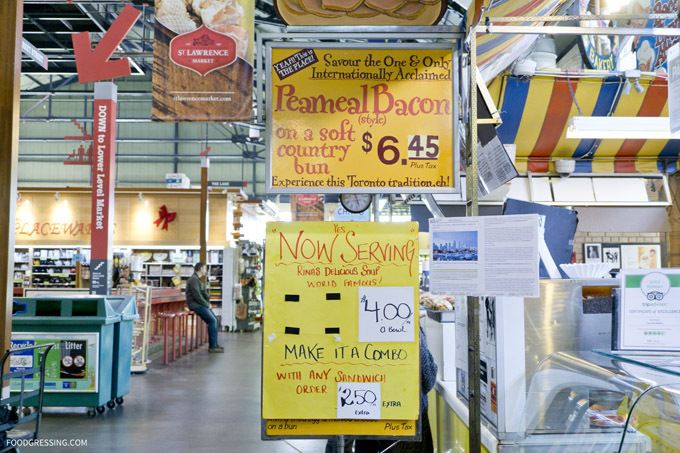 In this sense, customers get a higher level of service compared to fast-food competitors. The Yonge location of Panera bread has two levels. I found the second floor to be very spacious and quiet even though there were many customers. 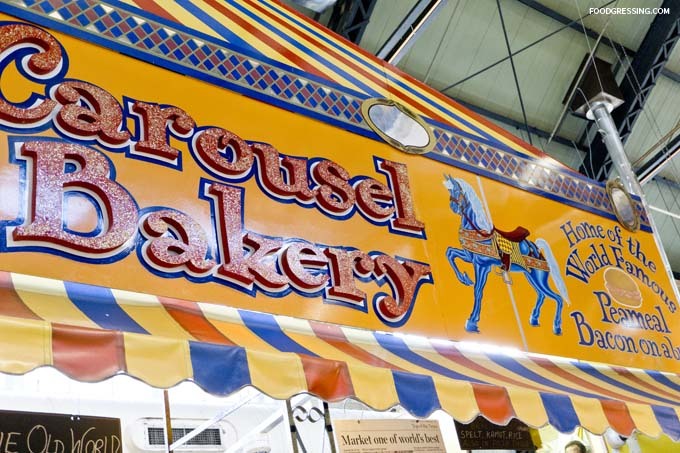 The baked goods on display were undoubtedly mouthwatering. 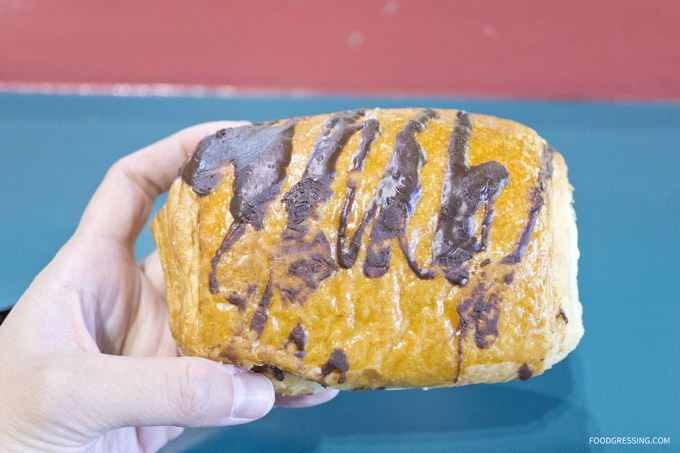 We tried two of the more decadent pastries: the Bear Claw and the Cobblestone. 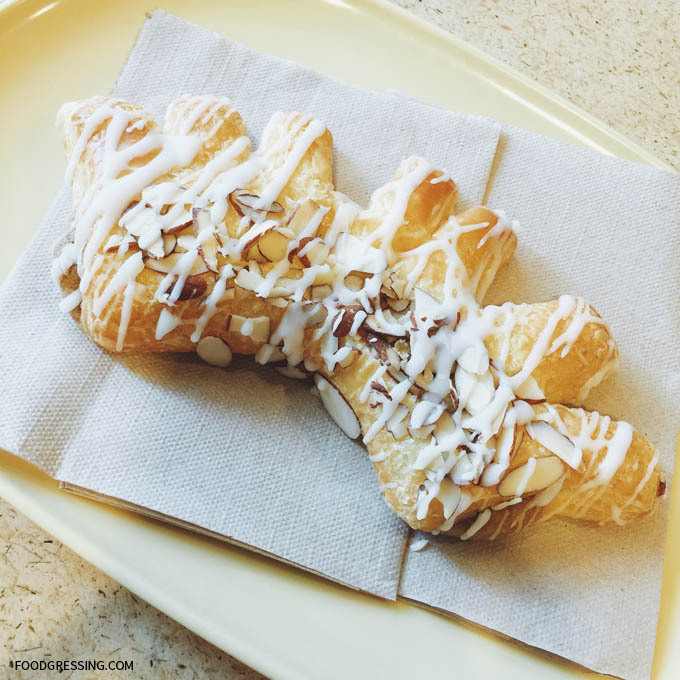 The Bear Claw (570 calories) had an almond filling and was drizzled with icing and sliced almonds. 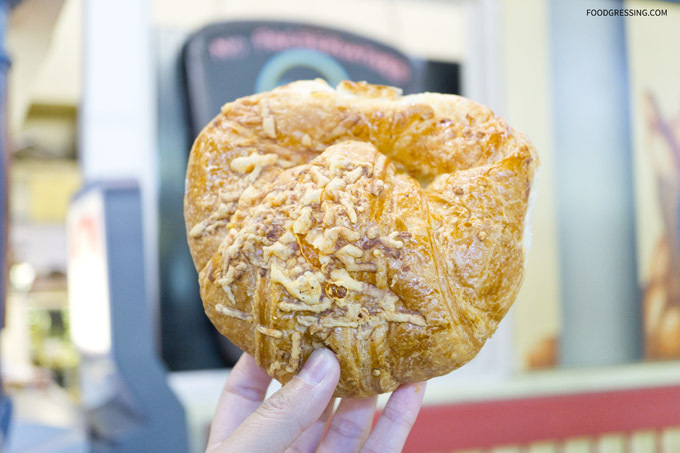 The texture of the pastry was buttery and crispy on the outside, but too sweet in my opinion. 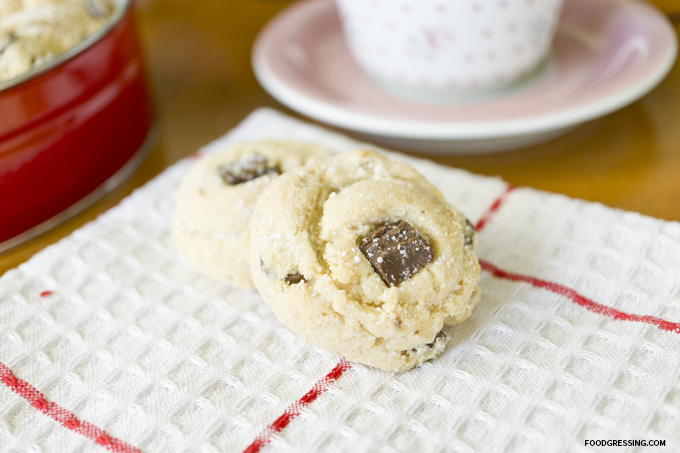 The sliced almonds added a nice chewy texture overall. 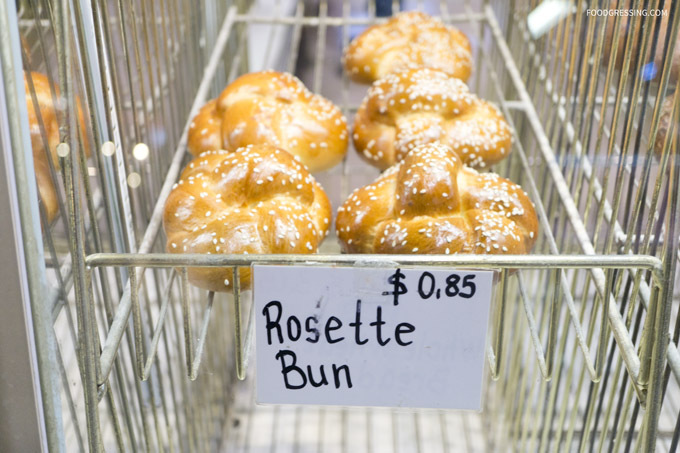 The Cobblestone was 10 calories less than the Bear Claw (560 calories) and was made of a cinnamon raisin swirl bread dough mixed with chunky apple spice filling and topped with streusel and white icing. It was also too sweet for my liking but the texture of the bread was reasonably tender and feathery. My pumpkin spiced latte (450 calories) had well-balanced flavours of pumpkin spice and salted caramel syrup. If there’s one type of food that I love, that would be pizza. 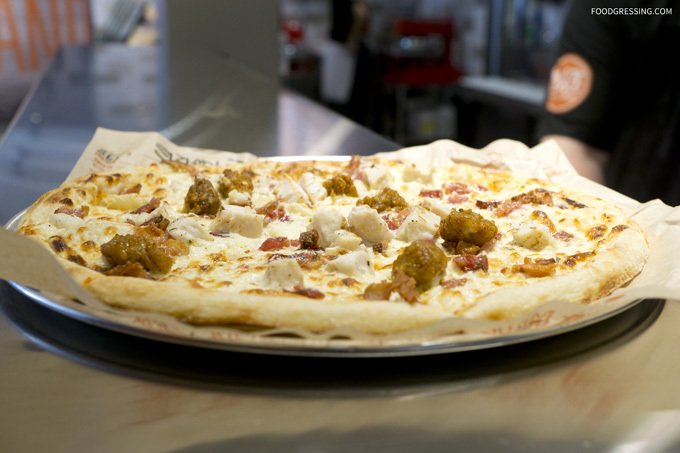 I’ll take a delicious crust, sauce and toppings any time. 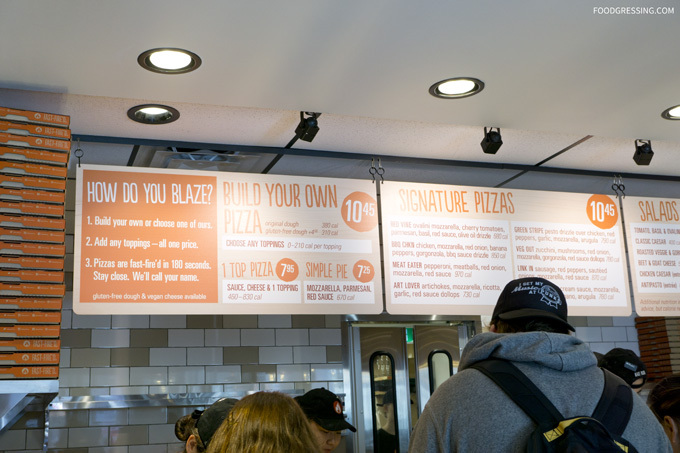 While we were exploring the busy Dundas and Yonge with our friend who now lives in TO , we came across Blaze Pizza. At first glance, it appeared to be a clean, modern and kid-friendly eatery so we decided to give it a try. 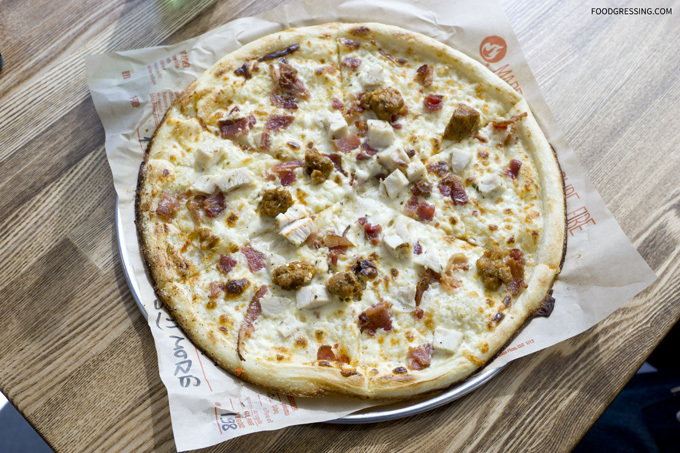 We had not heard of Blaze Pizza before, but we soon learned Blaze Pizza is a build-your-own pizza chain from the US. 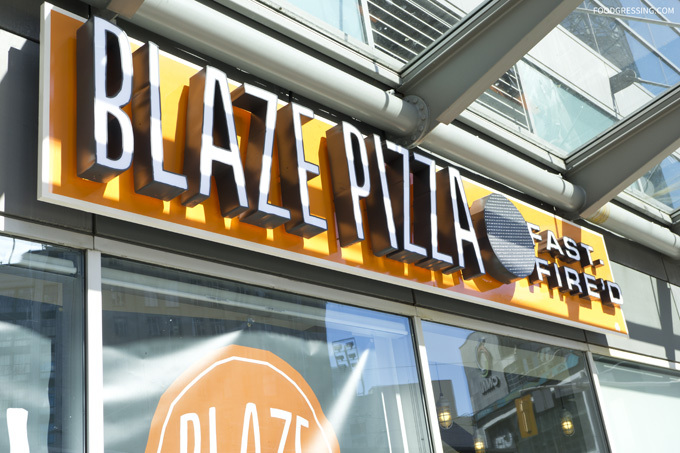 In fact, the Blaze Pizza in Dundas Square (also their only Toronto location) had just recently opened. We could sense the enthusiasm from the staff (more on that later) and became eager to try their pizza. 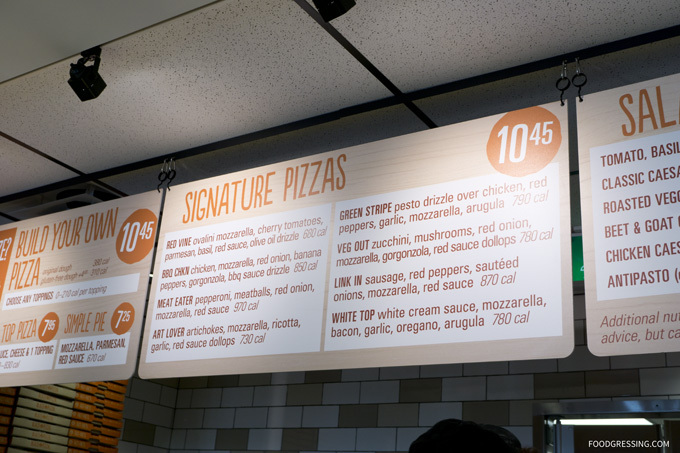 The concept at Blaze Pizza is simple: build your own 11″ pizza with unlimited toppings or order a signature one all for the affordable price of $10.45. You won’t need to worry about waiting long for your pizza to be baked because they are fast-fired in a hot open-flame oven and supposedly ready-to-eat in less than 180 seconds. They also have a gluten-free crust available as well (+$4) and vegan cheese. 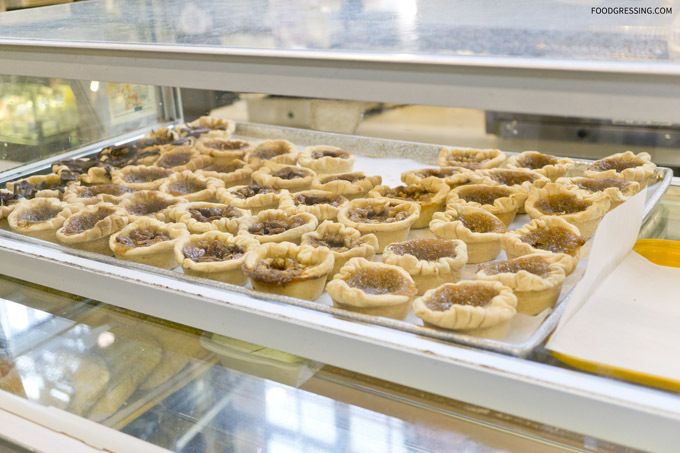 Calorie information is posted for those who are health-conscious. 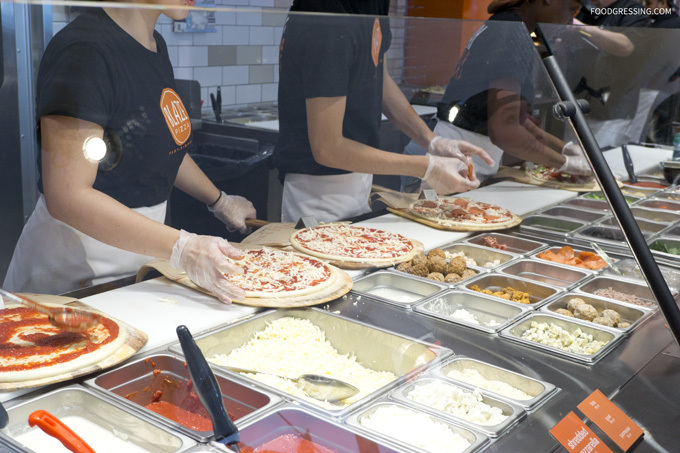 The pizzas are created via assembly line and I was *surprised* by the number of staff handling my pizza. Think about Subway where it is just typically just one staff person putting together your sandwich. 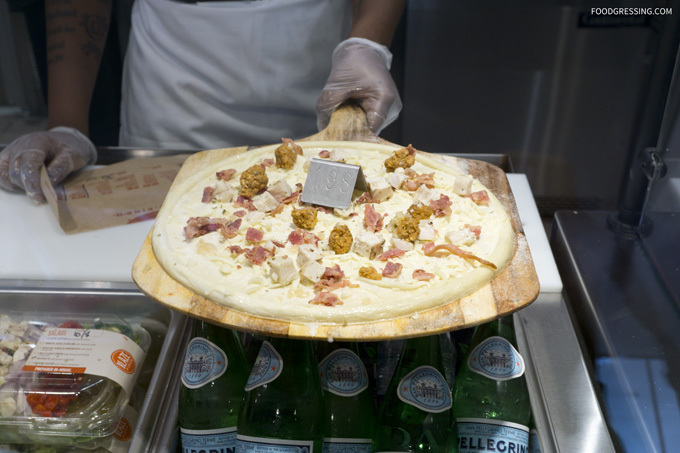 At the beginning of the assembly line, your name is noted on the parchment paper of the pizza. The staff person at each assembly station then greets you by your name before they handle your pizza. In some ways, I found that this can make you feel a) like a valued customer or b) very annoyed. 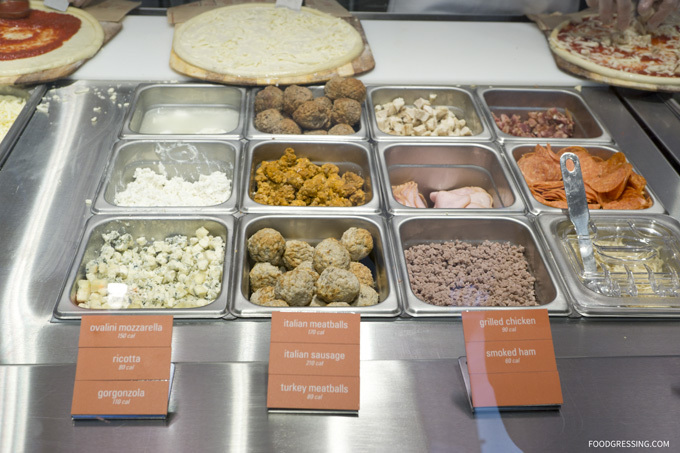 Aside from having my name called out several times, I noticed that there were plentiful choices for toppings, cheeses and sauces. We went with two signature pizzas: the Meat Eater and the White Top. The crusts of the pizzas were thin and wonderfully chewy and crispy. 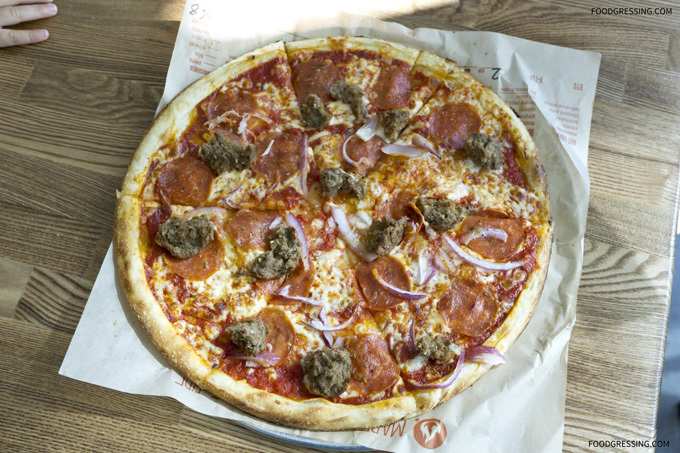 The Meat Eater consisted of pepperoni, crumbled meatballs, red onion, mozzarella, and red sauce. There was meat in every bite with meatballs being tender and pepperoni being crispy. The White Top had cream sauce with mozzarella, applewood bacon, chopped garlic, oregano, and arugula. The arugula gave it a fun texture and the pizza had an overall nice smokey flavour from the applewood bacon and garlic. To finish off our pizza feast, we had a s’more pie which had chocolate and marshmallow sandwiched between two McVitie’s biscuits. 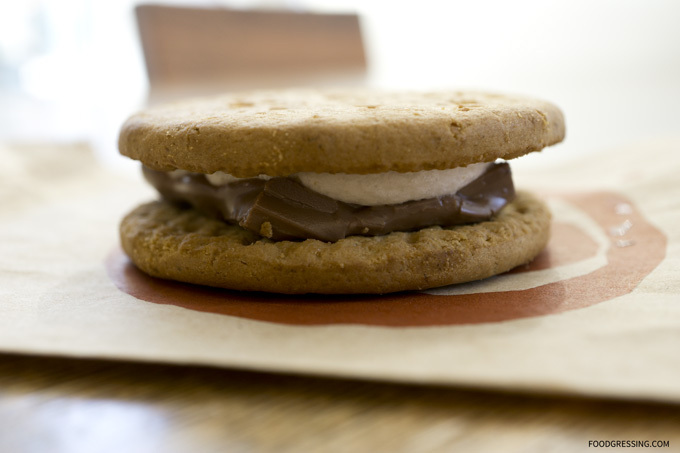 The chocolate and marshmallow appeared to be premelted, but they give you the option of heating it more. I got them to heat it up for me but it was just warm. 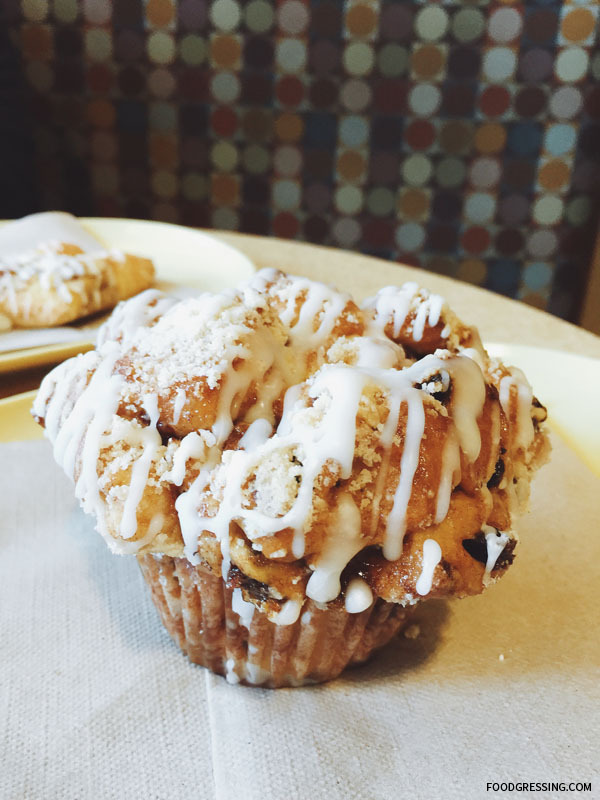 Perhaps it could have been a bit warmer to ensure the center was nicely gooey. In general, I thought the s’more pie was good but nothing to write home about. During our trip to Toronto, we met up with a friend who had moved there two years ago from Vancouver. While exploring the streets one evening , I developed a craving for bubble tea. 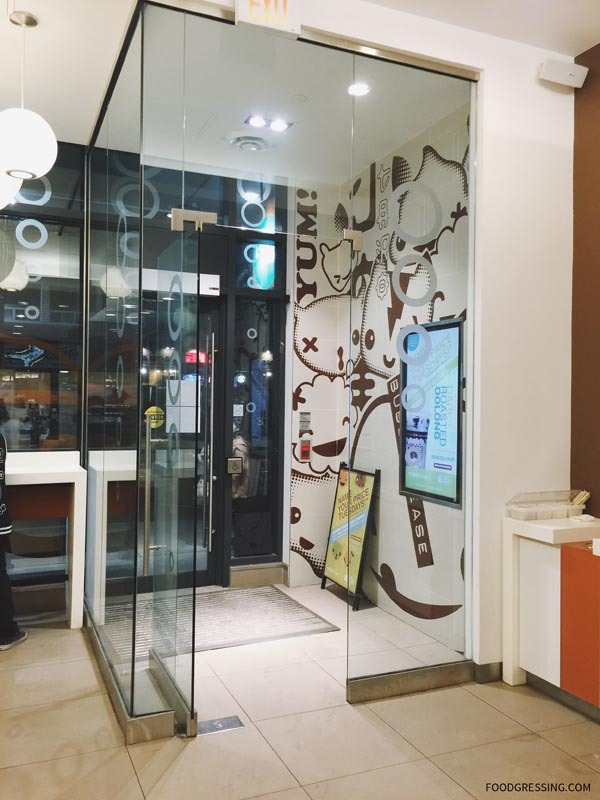 I had enjoyed various flavours of bubble tea from Chatime in Vancouver so I suggested that we visit their Toronto location. Unfortunately, there was a very long lineup when we got there. We even stood in line for a few minutes only to find it moving too slowly for our liking. 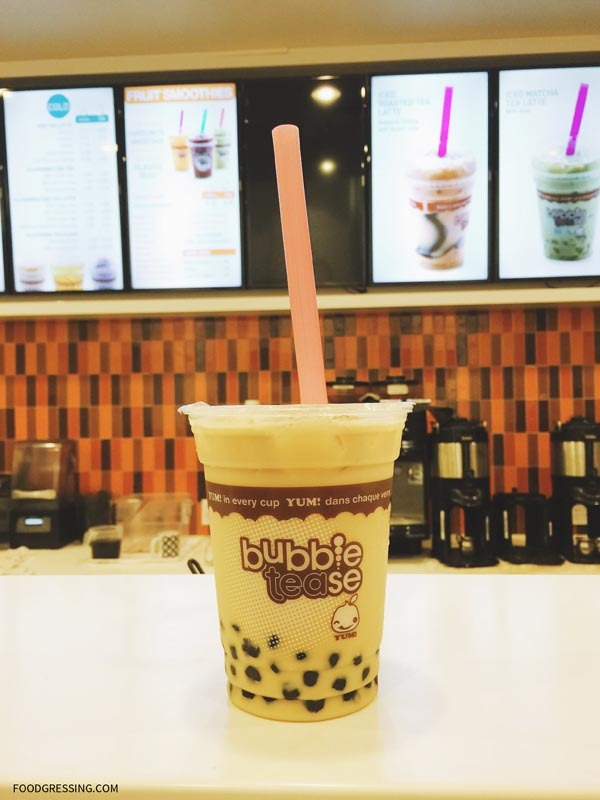 The next closest bubble tea shop was across the street, Bubble Tease, and we decided to give them a try. 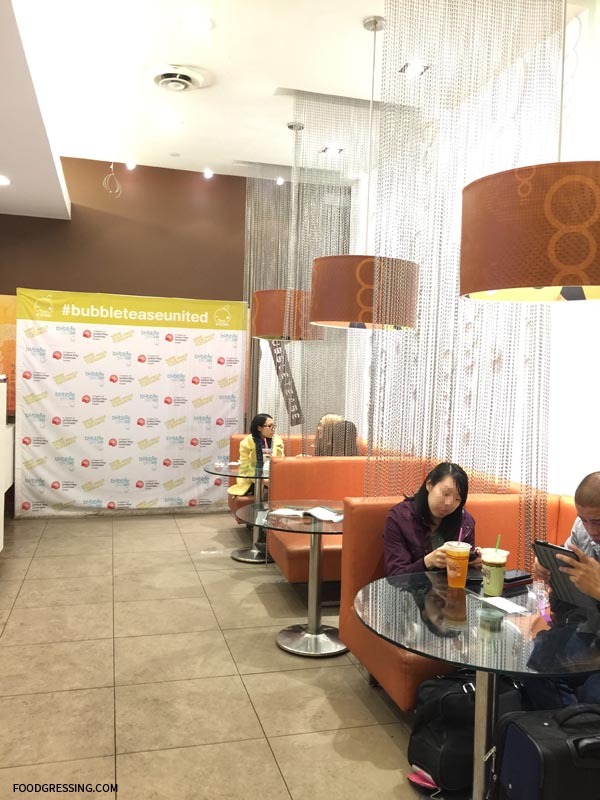 I soon learned that Bubble Tease is a chain and that their Dundas location is just one of seven stores in the Greater Toronto Area. Bubble Tease’s interior is much more spacious and modern than the Chatime across the street. I thought it was neat that they had little booths with beaded curtains. 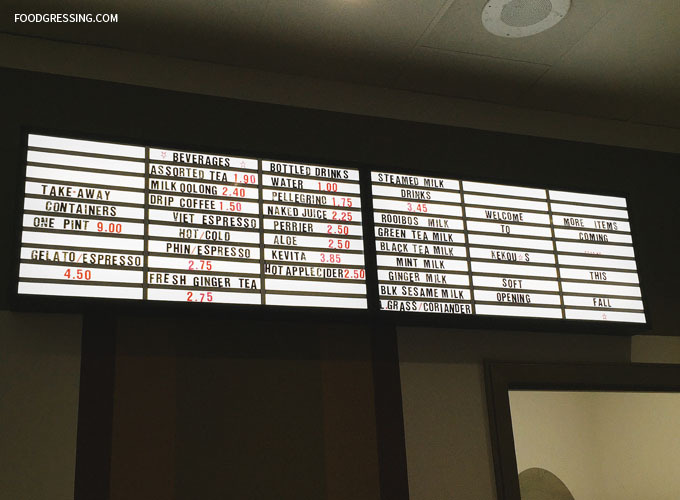 Bubble Tease’s menu is simpler than Chatime’s. It includes your usual fruit smoothies, ice teas, and slushes. 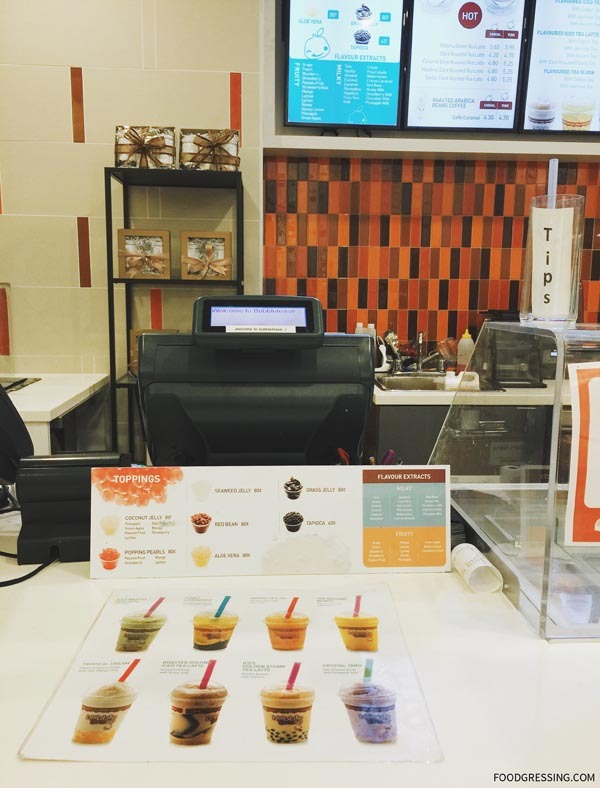 Prices are comparable to Chatime as well with drinks around $4 – $5. 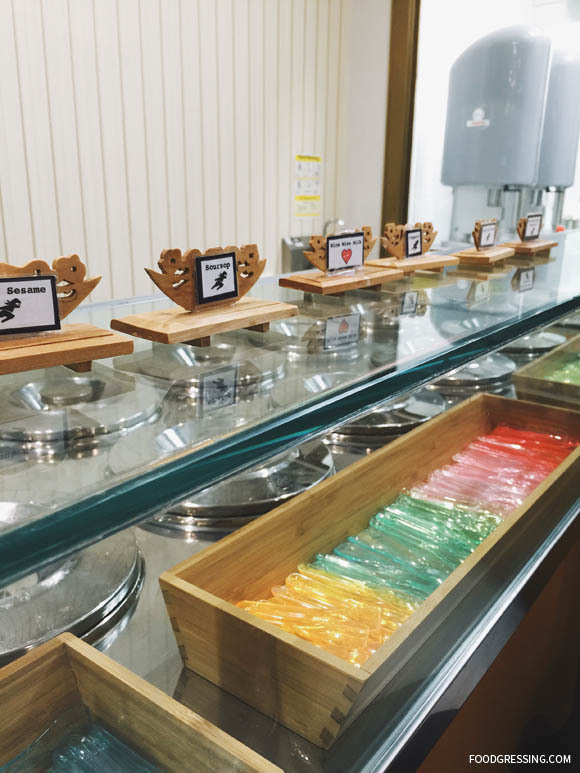 Toppings offered include tapioca (+$0.45), seaweed jelly, red bean, aloe vera, and grass jelly (+$0.80). 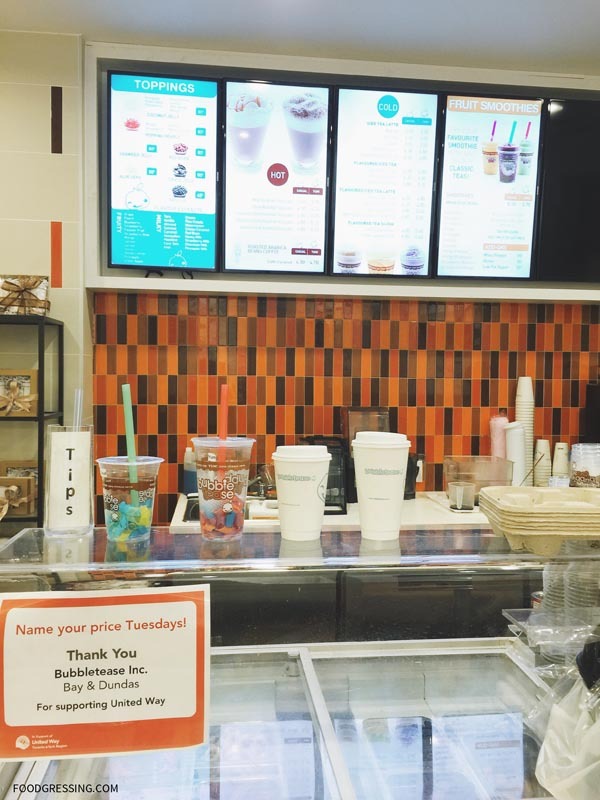 They apparently also have “Name Your Price Tuesdays!” on feature drinks where to support United Way. My husband and I shared an ice golden assam tea latte with tapioca which I found to be a bit watered down. The tapioca was acceptably chewy. My friend had a “casual” (regular) dark roasted tea latte which he described as okay.